As parents of a rambunctious toddler, we’re always interested in getting our son outdoors to explore and learn. So we were excited to learn about the Mercer Island Public Library Early Learning Garden from our clients on Mercer Island. (Ecoyards frequently works with Mercer Island customers on design-and-build landscape projects; we also help many Mercer Island customers maintain their lawn and landscapes). The public library garden opened last fall, thanks to sweat and labor from hundreds of community volunteers. 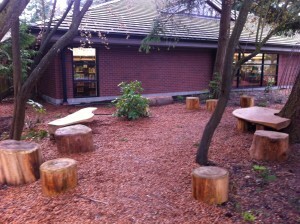 The Mercer Island Library worked with the Pomegranate Center to build a unique outdoor space that connects kids with nature and literacy. The landscape design does a lot with a relatively small space that surrounds the library. A short trail starts at the parking lot and wraps around the west and north sides of the public library. It connects three gathering circles: basalt columns in the smallest, granite boulders next and cedar benches and stumps to sit on in the last and largest gathering circle. 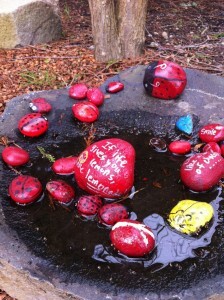 The garden recognizes that literacy and life-long learning can go beyond books and reading. Young kids have a sense of wonder and imagination that can be cultivated early on, both indoors and outdoors. Alphabet tiles handmade by children and other volunteers are placed throughout the trail to help the library’s youngest patrons develop early literacy skills. 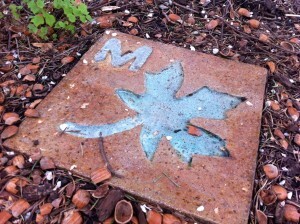 The tiles illustrate animals and plants that can be found on Mercer Island, such as B for butterfly and J for jay. The paths are filled with empty hazelnut shells (yes, they come from Washington), and make for a fun crunching sound under feet. 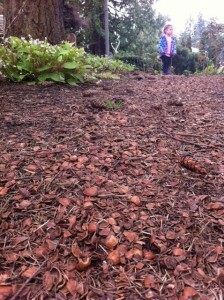 Child walks on path full of hazelnut shells. There’s a lot for gardeners to love as well. 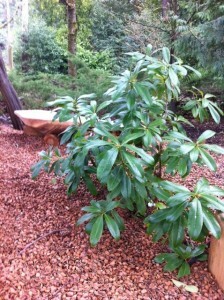 Northwest native plants such as rhododendrons, ferns and Oregon grape.